Loch Nairn is a special place offering its guests all the amenities of a private club without the expense. I believe this has brought a new audience to Loch Nairn that might not otherwise visit a public golf course. Our grounds are breathtaking and we lend ourselves to beautiful outdoor weddings under the 17th Century William Penn Maple Tree. We have lovely Terrace dining at the Farmhouse, which overlooks the country gardens as well as patio dining at the Greathouse and Tavern. But perhaps the most incredible aspect of Loch Nairn is the story of how it came to be. It all started in 1969. I was a housewife, mother of two wonderful athletic boys whose games I followed all over the country, and in my spare time, an avid golfer. In the summers my niece and I were on the horse show circuit with the boys in tow with their mini bikes. We had just designed and built our new home situated on 70 acres with a barn and large pond. It was the good life. Then one day everything was turned upside down. 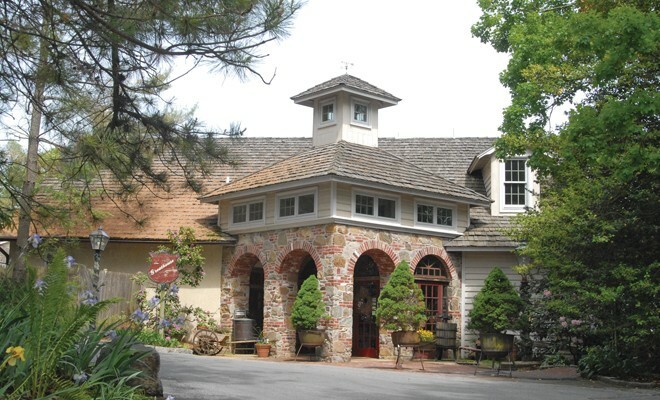 My husband Hank wanted to start designing and building golf courses and unbeknown to me, he and his partner purchased The Red Fox Inn, a large restaurant with a motel and a 9-hole golf course. Hank was only interested in the golf aspect of the business. The restaurant and motel just happened to be sitting on his land and just like that, I went from a happy housewife to running a restaurant! I knew nothing about restaurants, which was obvious to the seasoned staff of older women who resented my being there. I worked from 7 am to midnight (and that was an easy day) they soon learned I wasn’t afraid of hard work. I finally gained their respect. My husband was my greatest supporter, encouraging my many changes to the old Inn such as turning the old barn into a banquet room, dinner theater, golfers grill and locker rooms. We only had one piano so I dragged that poor old thing from building to building. My staff, I am sure had never worked with anyone like me. If it needed doing I got it done with the help of willing or unwilling staff. I opened for breakfast and closed. The buildings were haunted, and everyone knew it. One evening my headwaiter announced that he would never go to the liquor room ever again. He didn’t like the gentleman he met downstairs! I closed many a night by myself with my hair standing on end. Weekends I would host breakfast. I usually had one chef and several waiters. On one particular day only one waiter with a very thick accent came to work. I cooked while he was the lone waiter and host. The motel was full, and might I say it was a disaster? At one point the waiter stood in the middle of the floor clapped his hands and announced, “I suggest scrambled”. The guests were entertained & forgiving. The economy was getting very bad. We were paying interest rates higher than 20%. Times were very difficult. I remember one day driving in to work very tired and saw smoke coming out of the roof and I sat there thinking how easy my life would be if it burned down. Should I let it burn? After not too much thought I decided to tell my husband. What a scene the three of us putting that fire out. To make life tougher, for three years while all of this was going on Hank was away in Jamaica building a wonderful world-class golf course, Cinnamon Hill. That was the hardest 10 years of my life but without those years of experience, Loch Nairn wouldn’t be what it is today. The adventure continued when we sold the Red Fox Inn in 1984 and moved to the adjoining property now known as Loch Nairn. Hank with our sons rebuilt the original 9 holes of golf and added 9 more. There was a small lovely farmhouse, which became a golf shop and a bar with a small 10 table dining area. My intention was to downsize and offer our guests golf, a hot dog and a glass of beer but before long I felt the need to fix up the old farmhouse and offer lunch and dinner. It was too nice not to share & I loved creating our unique ambience. My concept of only serving healthy, fresh food, no chemicals, preservatives or additives was very well received. With everything to be made on property, no frozen foods, no freezers no microwave ovens. I started cooking simple items for lunch later hired a French chef that showed up half the time. Fortunately I had a young bartender follow me from the Fox. She was a very good cook and jumped in. I quickly hired a very talented young man who gave us his wonderful crab cake recipe. Presently we have Chef Roland as our executive chef. Chef Roland works & coordinates two buildings and two kitchens. He is a gem. The Old Farmhouse Restaurant became so busy that I had to convince my son Chris who was running the golf end of the business to let me use his golf shop for a dining room on weekends. Every Friday and Saturday night I somehow managed to transform the golf shop into a lovely dining room with candlelit, linen covered tables, oriental rugs, paintings etc. Our next project was born from my husband’s love of wine. We transformed a creepy old underground room in The Farmhouse (that I avoided at all costs) into a spectacular wine room with chefs table that creates a most memorable experience. Be sure and visit when next here. Again in 1989 we realized we needed even more room to accommodate golfers who weren’t happy sharing their space with ladies and gentlemen dressed to the nines. I didn’t want just another building it had to be special. So we hired our very talented friend Howard Curtis, to help us design and build the building of my dreams. The Greathouse. I soon began booking weddings and golf outings in The Greathouse. The tavern enjoyed by the golfers is my favorite room. Adorned with a wood burning fireplace, gabled ceilings & huge beams from which I have hung a family old town canoe, porch swing, three wheel tricycle, life size flying goose, the garden gate, wine barrels and much more. It is truly unique. Still we needed more room so the patio off the great room was the logical place to go. Hank came up with the plans for a Round Room. Again Howard was called in to build the round room, a different concept that is a beautiful addition to the properties. Another patio was added off the round room and tavern. I am still looking for ways to expand. That’s downsizing. Loch Nairn came from an unexpected and long journey that I am so fortunate to have traveled all the while hearing my father’s voice. You started it. You will finish it. I’m trying! I have worked every aspect of the business but the position I loved the most was hosting. I got to meet, greet and know my guests. I saw that they were well taken care of and said good night to satisfied smiling faces. I love it when guests tell me how much they enjoy the ambience I created, the food Roland created and the service of rare excellence. It’s very rewarding. Whether you are interested in a round of golf and lunch at the Tavern or are looking for a unique venue for a special occasion it would be our honor to share our historic property with you. For more details visit our website www.lochnairn.com.